Developing a web application today is probably one of the best times to ever do so, at least, if you can figure out how to get your environment set up. Frameworks like Angular, Aurelia, React, and countless others are incredible tools, but there's a learning curve to make them do your bidding. Node modules, npm, gulp, grunt, bower, webpack, babel, the list goes on. Dependencies, environmental configurations, and all sorts of other garbage can often get in the way. It's a horrible sign when it can take several hours, just to get that plumbing done. Quite often you might just want that File > New Project experience, and let someone else handle all that crap. Well, a few folks at Microsoft seem to be inclined to agree with you. As a bonus, its GitHub repo is also very well documented with examples and a Getting Started guide. Getting started is extremely easy. The project itself comes with a pre-configured Yeoman generator that allows you to spin up a new project within a matter of seconds from the command-line. After making your selections a quick dotnet run command should get everything going as expected. 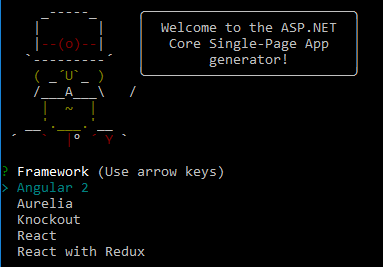 Microsoft.AspNetCore.SpaServices - If you are building a SPA application with Angular 2 or React, then this might be your guy. It comes with the necessary tools to handle server-side prerendering as well as middleware support for webpack. Microsoft.AspNetCore.AngularServices - Very similar to the SpaServices package with the exception that it has some Angular-specific helper methods and support for "cache priming", which pre-evaluates AJAX requests on the server, so that your client-side code won't need to hit the network after being loaded. Pulling those down will wire up the necessary packages to get your .NET Core application talking with your preferred client-side framework (and any special middleware features like server-side rendering, etc.). Can a brother get a File > New Project? For some folks, a flashing cursor on a black command prompt is the thing of nightmares. If you are a GUI guy, then don't fret, there's something for you too. This is still quite a work in progress and not all of the popular frameworks are out there yet. However, the Core Template Pack itself is open-source, so if you really need to get it working with your MagicJSFoo framework, then you can make it happen. If this piques your interest at all, then I'd encourage you to read Steve Sanderson's post on the topic which covers all of the major features in great detail, such as server-side rendering. Page the Doctor! When Entity Framework Paging Goes Rogue!